"A king has his reign, and then he dies. It's inevitable." So said Meredith Vickers to her aging megalomaniac father Peter Weyland in the film Prometheus, on his efforts to cheat death. 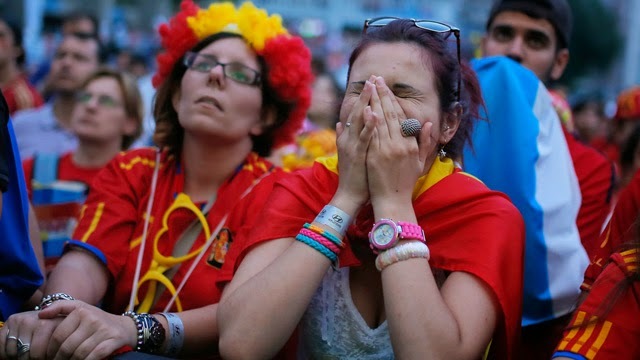 No great side lasts forever, success is cyclical, so at some point Spain's position as the best team on the planet was going to come to an end. The shocking manner in which it did has left some searching for answers, and there may be a bit more to it than a few aging players. The key to Spain's success over the past six years has of course been their brilliant midfield. Anchored by the irresistible twosome from Barcelona, Andres Iniesta and Xavi Hernandez, Spain's quick and short passing has beaten all comers. Even without a truly world class striker since Fernando Torres went off the boil about three years ago, they've had enough quality in the middle of the park to win regardless. This tournament however was one too many for Xavi as he was badly exposed by the Netherlands and dropped against Chile. Keeper Iker Casillas, who has been in and out of the Real Madrid side for two years, floundered badly in the first two matches, making several key errors that contributed to Spain's exit. 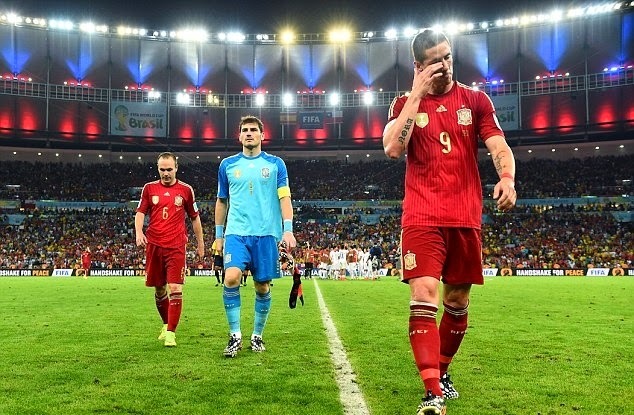 Misplaced loyalty to players that were clearly past their best was manager Vicente del Bosque's great failing. Perhaps seeing the issues caused by Casillas and his supporters in the squad at Madrid when Jose Mourinho dared to drop him, made del Bosque wary of replacing his number one. Leaving out Xavi, who played every minute of Spain's three successful major tournaments, would have also been a difficult call to make. At club level Thiago Alcântara and Cesc Fabregas were forced to seek opportunities elsewhere after failing to get in the team ahead of him at Barcelona, despite his best years being behind him, such is his influence. The waning effect of these two players was felt off the pitch as well, as it's been rumoured in the Spanish press that they were the peacemakers who kept the often fractious dressing room containing Madrid and Barcelona players together. Xabi Alonso, reportedly an unpopular member of the squad due to the perception of him being a Jose Mourinho disciple, spoke of a lack of desire within the squad to be champions again and an unhappiness. The stormy Mourinho era at Real Madrid had certainly worsened the relationships between players from "Los Blancos" and Barcelona, with the often heated rivalry between the two sides taking on a nastier, more personal edge. Whether it was fatigue, the reliance on aging players or these rumoured feuds within the squad, the era of this great side is at an end. There was a brutal finality to it all, and if Spain are to compete for the European Championship in France in two years time it'll be with a significantly different looking side. To those that found their vaunted Tiki Taka a bore to watch there'll be great joy this week, but to many others there'll be a bit of sadness as this team passes off into the pages of history.